Telemachus: What One Policy Change Should Be In President Obama’s Budget...But Isn't? What One Policy Change Should Be In President Obama’s Budget...But Isn't? Last week, we saluted President Obama for saying just three little, but important words in his SOTU (State of the Union) speech: ‘budget’, ‘freeze’ and ‘PAYGO’. All in the same paragraph if you can believe that. Even though the ‘budget freeze’ part would only apply to less than 1/6th of the overall budget in precisely all the non-defense, non-entitlement programs that are not causing all of this explosive growth in deficits and debt in the first place, it was still newsworthy. First time in a decade that those 3 words had come out of a U.S. President's mouth. We won’t go into a line-by-line critique of the Obama budget because that would only obscure the following most important fact: It spends too much. Way too much. Plain and simple. How much more simple can it be stated to a supposedly advanced, educated western civilized democracy? 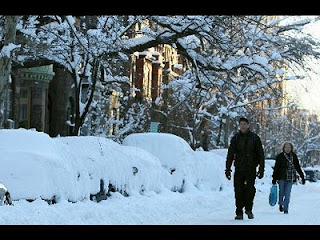 The ‘mini-ice age freeze’ in Washington today is nothing compared to what needs to be done to the whole budget if we are ever going to get a handle on it. Maybe if we can just keep Congress out of session due to 3 feet of snow for the next 7 years or so, (it would take at least that long) we will be able to balance the budget again when the economy finally recovers. Contrary to popular (mis)belief, the growth in the federal budget is not caused by 1) international aid; 2) welfare mothers; 3) bank bailouts or even 4) the wars in Iraq and Afghanistan. We could take all of those out of the budget right now completely and there still would be an unimaginable amount of unsolved deficit-spending and national debt staring us in the face for decades. Oh, and yes, the AARP. Without a doubt, when history is written 100 years from now about the United States, that is, if there is still some vestige remnant of the United States around someplace, there will be a large chapter on the intransigence of the AARP lobby in Washington that frustrated every single serious proposal ever presented to reform entitlement programs with a complete disregard for the long-term future consequences of their actions. So if you haven’t done so yet, burn your AARP card today to stay warm and resign your membership in that august body. Unless getting a 15% discount on movie tickets means more to you than saving the Republic for your children, that is. Work a little bit longer, like 3 months, for each successive year past the magical age-65 threshold for Medicare and 66 for Social Security until the official age is 70 years old. You are gonna have to work longer anyway to recover from this nasty recession and have the funds you need to retire so why not? If you don’t want to do anything like this option, the only recourse is to raise your income taxes by an average of about $5000 and keep them there on an indexed basis for the next 30 years. We do not want to see any more dodging of the tough issues of higher taxation versus lower spending because that leads to more national Debt and that starts with ‘D’ and that rhymes with ‘T’ that stands for ‘Trouble’ down the road. ‘Debt is for political cowards, not political leaders’. Make a bumper sticker out of that one. Would you be willing to do such a selfless act for your country if you thought it was going to help: 1)reduce this burdensome debt on your children; 2) balance the budget in your lifetime; 3) allow your favorite social/defense spending programs to stay intact; 4) lower the need to pay much higher taxes and 5) Save the Republic…all in one fell swoop? There is a new proposal out that we are going to call the ‘Ryan Budget’ because he is the leader of the Republican side on the House Budget Committee. They have included this age adjustment feature to their proposal that you can take a look at: 'Roadmap'. We think his whole schedule of implementation should be accelerated considerably but it is at least a good faith effort to start with from the Republican side of the aisle. And here’s the truly great thing: Not one single senior citizen now over the age of 65 for Medicare or 66 for SS today would lose one penny of their benefits. Not one. So if you have made it over the finish line and are now grandfathered (why do they never say ‘grandmothered’?) in to both programs, you can turn off your hearing aids and ignore this complete debate. This is one for the Boomers and their kids to settle, not you.